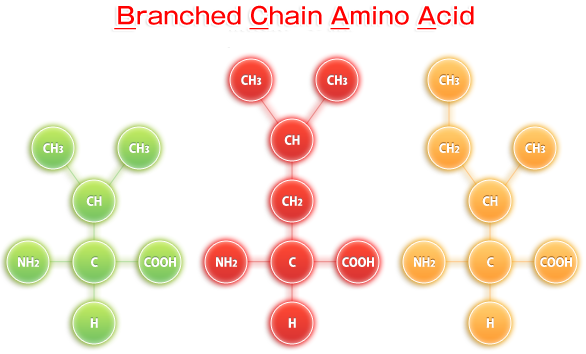 BCAAs are Branched Chain Amino Acids, 3 amino acids; Leucine, Isoleucine, and Valine, that have aliphatic branched side chains that distinguish them from other amino acids. Over the years BCAAs have gained a lot of attention in the sports nutrition industry… as an effective recovery and muscle growth supplement for athletes. The proven effectiveness of BCAA supplements has sparked a large amount of human research on BCAA dosing and timing around workouts and meals. From this research we have found that there are crucial times where BCAAs are most effective and will generate the highest anabolic response improving recovery and muscle growth. BCAAs supplemented 30 minutes before your workout will not only increase muscle protein synthesis but will also prevent your muscle from being broken down during endurance training. BCAA supplementation (predominantly Leucine) causes a signalling cascade which increases mTOR (Mammalian Target of Rapamycin) a protein which encodes increase in protein synthesis, cell growth, and cell proliferation. Increasing mTOR signalling before a workout prevents your body from stripping muscle protein for use as energy (very good for those who work out on an empty stomach or do endurance training) as well as will help your body rebuild muscle as you are causing microtears working out. Taking 5-10g of BCAAs or 1-2 servings of DYNAMIS AMINOpulse™ will create an anabolic environment in your body for muscle growth, will prevent muscle from being broken down, and will reduce delayed onset muscle soreness (DOMS). BCAAs supplemented 15 minutes after your workout along with whey protein and carbohydrates will cause an even greater anabolic response than whey protein and carbohydrates alone. This is because the BCAAs directly increase muscle protein synthesis (muscle building) more effectively after you have been working out and causing microtears in your muscles. The combination with whey and carbohydrates will ensure that the BCAAs and protein are transported more effectively to your muscles and enhance recovery even more than whey and carbohydrates alone. Supplementing BCAAs with Glutamine (found in DYNAMIS AMINOpulse™) has also been shown to reduce the stress hormone Cortisol as well as increase the serum Testosterone:Cortisol ratio in the blood post workout creating a maximum muscle growth and fat burning environment post workout. Recent human research has shown that the ingestion of BCAAs as well as Leucine alone will increase muscle protein synthesis, regulate blood sugar, and make more of your meal go towards building muscle. The technique of Aminopulsing consists of supplementing BCAAs before a meal to increase the protein/amino acid content of the meal, increase the bodies absorption of the BCAA supplement, and boost muscle protein synthesis pre-meal so more meal is going towards helping your muscles recover and less is being stored as fat. Aminopulsing with protein shakes, post workout meals, and meals up to 48 hours after your workout will help you recover, increase muscle mass, and get leaner, faster. BCAAs have been shown to have significant anabolic effects in low doses and further amplified anabolic effects at higher doses. Human research has demonstrated that there are no diminishing returns in BCAAs up to 20g/serving and 80g/day. This means that the more BCAAs you take spread throughout the day before/after workouts and before meals, you will still get the improved benefit up to 80g of BCAA/day. For those who train everyday or multiple times per day, this means you should be having 10g of BCAA before/during/after workout as well as before every meal for maximum recovery and results. ‹ Fasted Cardio – is it the secret bullet for optimum fat loss?